Kerala has a fairly rich mythological heritage and there are temples of several gods and goddesses almost throughout the state. All these temples are not only significant from their religios importance but are also great architectural set ups. Some are huge and richly decorated while others are small with simple decor, but invarianbly all speak volumes about the highly religious temperament of the people. Chottanikkara temple, located near Ernakulam enshrines Bhagawati – the mother Goddess, is one of the most popular deities in Kerala. On way is the Poornatrayesa temple at Tripunittura. The goddess is worshipped along with Lord Vishnu. People who have mental illness seek refuge in the divine mother, who graciously cures all her devotees. Goddess Rajarajeswari is the presiding deity. This deity is worshipped in three different forms – as Saraswati in the morning – draped in white, as Bhadrakali at noon draped in crimson, and as Durga in the evening decked in blue. The image in the shrine is not fixed to the ground and is mounted on loose sand. Water offered during ablution ceremonies percolates underground. Guruvayoor, where the famous Sree Krishna Temple is situated, is one of the most sacred and important pilgrim centers of kerala. This is probably the only temple in the state that hosts the maximum number of marriages and rice feeding ceremonies (the ritual first meal for infants). The historic temple is shrouded in mystery. According to local belief, the temple was created by ‘Guru’, the ‘preceptor of the gods’ and ‘Vayu’, the ‘god of winds’. In the ‘Chuttambalam’ (outer enclosure) is a 33.5-m tall gold-plated ‘Dwajastambham’ (flagpost). There is also a 7 m high ‘Deepastambham’ (pillar of lamps), whose thirteen circular receptacles provide a truly brillant spectacle, when lit. The square ‘Sreekovil’ is the sacred sanctum sanctorum of the temple, housing the main deity. Within the temple, there are also the images of Ganapathy, Sree Ayyappa and Edathedathy Kavil Bhagavathy. Only Hindus are allowed inside the temple. This holy shrine, dedicated to Lord Ayyappa is a renowned pilgrim centre atop the rugged hills of the Western Ghats. The sanctum sanctorum nestles 914 m above sea level, amidst the virgin forest wilderness of the Western Ghats. The main pilgrimage is undertaken between November and January. Regardless of caste, creed, colour, they wear black dhotis and carry on their heads, bundles containing traditional offerings like coconut filled with ghee, camphor and rice. The Sabarimala Temple festival is celebrated in honour of Lord Ayyapan who is revered by all in India. There are two main pujas called the Mandal Puja and the Makara Sankranti Puja, which are celebrated from November to Middle of January in Kerala, during which time the devotees perform austerities and penance. Vadukkumnnatha is a prominent Shiva temple, in downtown Thrissur, Kerala. This is one of Kerala’s most ancient shrines, which also houses a museum of ancient wall paintings, wood carvings and art pieces of immense historical value. The ‘Pooram festival, falling in April/ May, attracts devotees and tourists from all over the world. It is a spectacular event, combining the majestic elephant pageantry with the frenzied playing of drums and cymbals and rounded off with a fireworks extravaganza. Enchanting and serene waterfalls welcome you at the entrance of the Sholayar ranges. One can find frequents buses to Athirappally from Chalakudy-40 km from Cochin on the Thrissur route. Athirappally is 77 km north of Cochin (Kochi). Thommankuth waterfalls is another marvellous wonder of the nature situated at 74 kms from Cochin. There are buses from Thodupuzha, which is 18 kms away from Thommankuth. Hotels and restaurants are available at Thodupuzha. This is situated on the Ernakulam Chottanikkara route 12 kms away from Ernakulam. In this largest archeological museum of Kerala, different types of sculptures, collection of rare coins, old weapons and collections from the Cochin Royal Family are exhibited. 8 kms away from Ernakulam situated at Edappally, this museum is a treasure house of important scenes of Kerala history from Neolithic age to Modern age. Apart from this, various famous paintings are also exhibited here. Several relics and heirlooms of archeological importance are protected in this museum which is situated beside the Town Hall road. The art museum at Thrissur is a treat for the connoisseur of art. Good collection of woodcarvings, metal sculptures and ancient jewellery are preserved here. The Pazhassi Raja Museum located in the midst of Kozhikode town has a huge collection of mural paintings, old coins and miniature form of temples. In the art gallery close to the Pazhassi Raja Museum, most of the paintings are those of Raja Ravivarma. This hill station a mere 61 km from Trivandrum is a tourist’s paradise. One gets enchanted by the sheer abundance of nature; the shimmering green waters of the winding streams and verdant woods do not spare anybody. It is at an altitude of 100 ft perched on the Western Ghats. It is a range of hills separated by valleys of dense lush green woods and orange plantations. The tallest peak here is Padagiri which is at a height of 1572 m while the shortest one is 467 m. The two and a half hour journey from Palghat to Nelliyampathy is a very thrilling one because there are nearly 12 hairpin curves on the ghat road. Also, dense jungles come on the way. Pothundi reservoir is a lovely place which is worth a stopover. Wagamon is engulfed by green tea gardens and deep puzzling valleys. All the trekking enthusiasts will enjoy climbing this 1100 tall hill. Situated at 64 km from Kottayam, this place also has to offer Thangal Para, the Indo-Swiss project and Kurisumala Ashram. Lakkadi registers the second highest degree of rainfall in the world. The place is is just green green green. It is one of the highest locations in Wayanad enriched with streams. It is situated in the north eastern tip of Kerala with Panamaram, Mananthavady and Kabini rivers enriching the land. Abundance of coffee, tea, cardamoms, Pepper and rubber plantations captivates one and all. Thirteen km. away from Munnar lies Mattupetty, at an altitude of 1700 m. above the sea level. The Indo-Swiss Dairy Project with the green meadows and the exotic cattle and the rose garden also attracts tourists. Situated at 16 km southwest of Munnar, this picturesque location, offers a unique feature-clusters of slender red and blue gum trees. Devikulam, meaning the lake of the goddess, has a lovely little lake hidden within the rolling hills. According to legend, Sita Devi, the holy consort of Lord Rama, came down to frolic in the lake and the place came to be known as the present name ever since. Malampuzha is in the site of a large irrigation dam built across the longest river in Kerala, the Bharathapuzha. It is set at the base of the hills of the Western Ghats. Beautiful gardens, amusement parks and facilities for boat cruises make this an ideal picnic spot. Other attractions are the rock garden, the fish-shaped aquarium, the snake park, the ropeway which takes the tourist on an aerial tour of the park, and the famous work Yakshi (an enchantress) sculpted by Kanai Kunjiraman. The most interesting feature of the rock garden is that the whole place is made of unwanted and broken pieces of bangles, tiles, used plastic cans, tins and other waste materials. The garden is a master work of sculptor Padmasree Nek Chand Saini. His rock garden in Chandigarh is world famous and attracts thousands of tourists every year. Kerala had been the hub of much political activity in the past and has witnessed the influx of various foreign powers, which settled down in various parts of the state. The imposing forts such as the St.Angelo’s Fort, Bekal Fort, Palakkad Fort built by these colonial powers speak volumes about the foreign influence on architecture. This fort in Ernakulam built by the Portuguese in 1503 is one of the oldest existing European monuments in India. The Catholic Church at Pallipuram is an important pilgrim centre. Hyder Ali of Mysore constructed Palakkad Fort in 1766 and later it was taken over and modified by the British. Situated in the very heart of the town, its sober silence reminds us of old tales of valor and courage. This is now protected and preserved by the archaeological survey of India. This fort situated near the sea coast about 2 km. away from Kannur town was built in 1505 AD by Sir Francisco De Almeiyda, the first Portuguese Viceroy of India. This fort was once controlled by the British.It is now under the archeological department. A broad and extensive beach in the backdrop of fisherfolk village life, Bakel fort has a scenic beauty and natural charm. This important tourist spot lies 26 kms south ofKasaragod town. Built by the Ikkeri Naikkan’s in the 17th century, this artifice stood past the time and still remains a marvel to the eyes. This Palace in Mattanchery was built by the Portuguese, and presented to the Raja of Cochin in 1555. It is popularly known as the ‘Dutch Palace’, as the Dutch renovated it during their brief reign here. The glory of the palace lies in the murals, which are in the best traditions of Hindu temple art. In the central courtyard of the palace is the temple dedicated to Pazhayannur Bhagavathi. In the coronation hall there is a display of dresses and palanquins used by the rulers of Kochi. Built by the Dutch in 1744, the Bolghatty palace in Ernakulam is on an island, off Cochin in the Arabian Sea. The building was once a Governor’s palace for the Dutch and later the home of the British Residents. Today, this is one of the prestigious hotels of the Kerala Tourism Development Corporation. Cheruthuruthy (Kerala Kalamandalam) north of Trichur, 29km away, near the Shornore Railway Junction. Mahakavi Vallathol founded Kerala Kalamandalam at Cheruthuruthy, in 1930. It’s main objective is to revive, preserve and develop the traditional art form of Kerala, particularly Kathakali.Now the Kerala Kalamandalam is functioning at Vallathol Nagar, in Cheruthuruthy with its new building complex the Natyagraha. The old Kerala Kalamandalam is still at Cheruthuruthy on the shore of Nila River (Bharathapuzha). The Samadhi of Poet Vallathol, the founder of the institution, is in the premises of the old Kalamandalam.It is in this academy that the best of Kerala’s Kathakali performers get their rigorous training. The institution also offers training in music, drama, and other dance forms including Mohiniyattom, Koodiyattom and Ottan Thullal. The Alwaye palace is situated on the banks of the Periyar River with beautiful circular verandas overlooking the river. This old palace building is now The Alwaye Guest House, which is one of the loveliest in this State. Dedicated to Lord Krishna is another pilgrim place for Hindus. The temple Aranmula can be reached from Chengannur on the Thiruvananthapuram – Kottayam route. A major attraction are the snake boat races held as part of the Uthrettathi festival in August/September. Aranmula is famed for its hand-made mirrors of polished metal called the “Aranmula Kannadi”. Portuguese missionaries established one of the most important pilgrim centres of the Christians in Kerala, popularly known as St. Sebastian Church, 22 kms; north of Alleppey. This church is near Sherthallai. The feast of St. Sebastian is held here every January. The largest and the best-preserved fort in Kerala, Bekkal Fort, in Kasarkode, is 16 km south on the National Highway. The beautiful Bakkel beach with the historic and archaeologically significant fort in the background is now being developed, into an international tourist destination. Earlier it was part of the kingdom of Ikkiri Naiks, provincial rulers of the Vijayanagara Empire.It became part of the Vijayanagar Empire. In the late 18th century Tipu Sultan captured it. An old mosque near the fort is believed to have been built by the Mysore forces. After the British overthrew him, the fort came under the East India Company. Though located at Thuckalai in Kanyakumari district of Tamil Nadu, (65 kms south of Thiruvananthapuram) this former palace of Travancore is a splendid example of Kerala architecture. It is a protected monument of the Kerala State Archaeology Department. The palace is noted for its excellent wood architecture and murals. 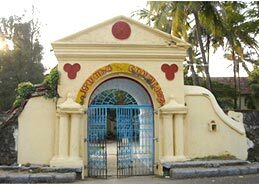 This 18th century palace known as Koikkal Kottaram is situated about fourteen Kms from Thiruvananthapuram at Nedumangad.The palace today houses a folklore museum and a numismatic museum as well. Situated on the MC Road, between Vaikom and Kaduthuruthi, Muttuchira has an interesting conglomeration of three churches of different periods built in the same compound. These churches display distinctive features of the evolution of Church architecture in Keraa, the oldest of which is a typical example of Neo-Boroque style. This is also another protected monument of the state. A former palace of Travancore kings, it was built in the 18th century at Krishnapuram in Kayamkulam in Alappuzha district.This monument is often reffered to as a miniature model of Padmanabhapuram Palace. This was a palace built for the Raja of Kochi in1552 AD by the Portugese. But posterity remembers this monument as the Dutch Palace, mainly because it was renovated and re-built by the Dutch East India Company. The palace has beautiful murals and a remarkable display of old Palanquins and armoury. This museum displays the erstwhile wealth and prosperity of the royal family of Cochin, including the king’s throne and crown. Also on display are other trapping of royalty like majestic beds, paintings, carving and samples of epigraphy. Tripunithura is also known for the nearby Chottanikkara Temple and the Tripunithura Temple. It was built in 1568 AD, the great scrolls of the Old Testament, the copper plates in which the grants of privilege made by the Kerala rulers Bhaskara Varma in A.D 1000 and the exquisite Chinese hand painted tiles are of interest. No two tiles are alike and are two hundred years old. There are also several finely wrought gold and silver crowns gifted to the synagogue by various patrons. The only way to discover the real Kerala is to cruise along its backwaters. You will experience a totally different Kerala as you sail down these soothing waters in a country craft and absorb this unusual representation of Kerala life. Kerala’s centuries-old, palm fringed backwaters stretch over 1900 kms. The backwaters act as a vital waterway for the transport of goods, people and their produce and are more often than not the only link between isolated villages and crowded towns. Stretched over a total expanse of 1500 kms, the backwaters have a network of 44 rivers, lagoons and lakes from north to south. As you sail along on a houseboat you drift into a land that time forgot and watch picture-book towns and ancient trading posts float by. You can see the sky shimmer through a coconut canopy and hear the wind to bring you the oarsman’s song. You can sail a cloud and dream a dream in the tranquility of the backwaters. When you wish to get away from it all and set your soul free, the one place which will surely soothe your soul is the backwater of Kerala. It is the best way to rejuvenate your mind and body. So if you are really looking for peace of mind, take a break at the backwaters of Kerala! Evolved around 600 BC in India, Ayurveda Science of medicine stressed on the prevention of body ailments in addition to curing them. Followed by the Dravidians and Aryans alike, Ayurveda has been practised ever since. Today, it’s a unique, indispensable branch of medicine – a complete naturalistic system that depends on the diagnosis of your body’s humors – vata, pitta and kapha – to achieve the right balance. Ayurveda believes in the treatment of not just the ailing part, but the body as a whole. Making it the natural way to refresh yourself, eliminate all toxic imbalances from the body and thus regain resistance and good health. Call it a blessing of God, Kerala’s friendly climate, natural abundance of forests (with a wealth of herbs and medicinal plants), and the cool extended monsoon season (June – November) are best suited for Ayurveda’s curative and restorative packages. In fact, today, Kerala is the only State in India which practices this system of medicine with absolute perfection.